The neckline is a trendline that is part of various patterns such as the Head and Shoulders pattern or the Double Peak pattern and is used as a trigger line in the pattern. Penetration of prices through the neckline after a pattern has been completed becomes an indication that bias in the markets may change and may be pointing to the future path of prices. In the chart below of Archer Daniels Midland, the neckline is penetrated only to be followed by a move back to the trendline where it moved sideways for several weeks before price trend began to noticeably weaken. The time it takes for a head and shoulders patter to form is often used to predict the time span of the resulting move in price trend in relation to the pattern. A break of the neckline lower in the head and shoulders pattern on the graph below is first an indication of weakness and possibly a change in the bias in current supply and demand. Secondly it points to the probability that price trend will continue in the same direction as the breakout for as long as the pattern took to form. All patterns and technical studies fail at various times and so it is a wise idea when investing to build a wide body of supporting evidence for any trade that you make. This is a powerful pattern that marks a top and also provides a downside price target. 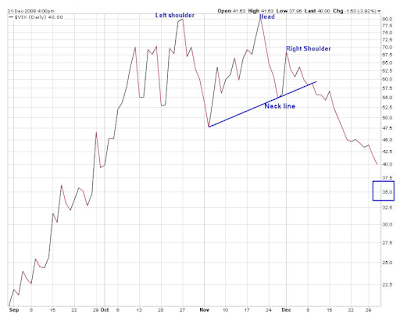 When a head and shoulder forms, we see a rise within an existing uptrend to a new high that creates the left shoulder. Prices then move lower, but rebound to another new high to form the head. From that point, we see a decline that does not violate the initial sell-off from the left shoulder. Prices rally again, but the failure to top the recent high forms the right shoulder. By connecting the lows that occurred after the left shoulder and head were formed, we identify the neckline. Once the neckline is violated, the pattern is complete and prices will move lower. In October, a strong uptrend took the VIX near 80 before a sell-off. This formed the left shoulder. A rally above 80 and subsequent decline created the head. When VIX then topped out near 70, the right shoulder was formed. The breaking of the neckline (blue line) pointed to lower prices. 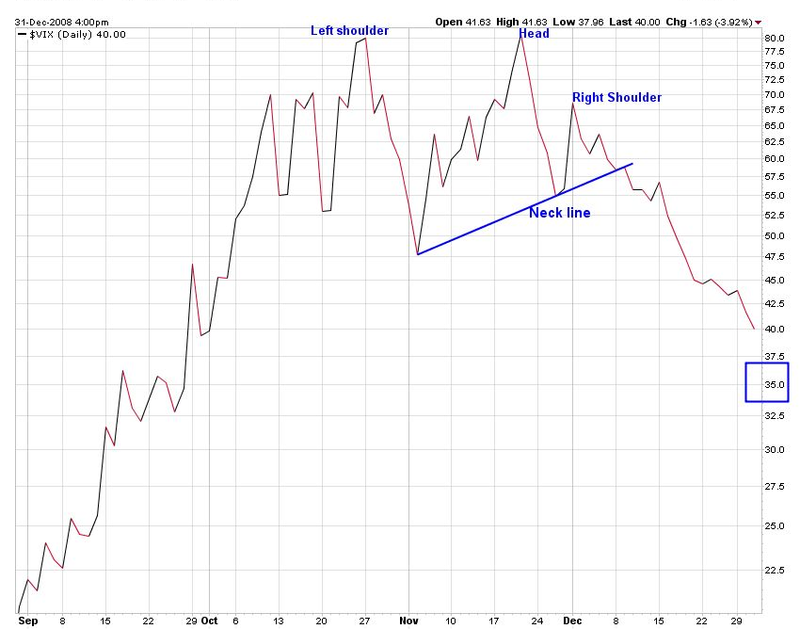 To estimate the downside target, we use the difference between the head and the neckline. This gives us a 35 target (blue box). We post this most recent spot gold price to our web site each morning, and use it in our historical gold prices database. This London P.M. or afternoon fix gold spot price, actually is set during the U.S. morning, about 9:00 A.M. Eastern Standard Time. 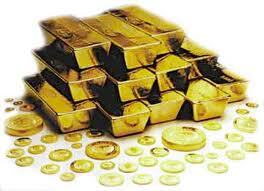 During the U.S. trading day, we do business based on the latest Comex spot gold price. This is a constantly changing price from the New York markets, and trading goes on until about 2:30 P.M. Eastern time. When doing gold business with us via this website, we will update all our bullion and portfolio prices based on the current prevailing gold spot price, which is from the Comex market during the U.S. trading day.